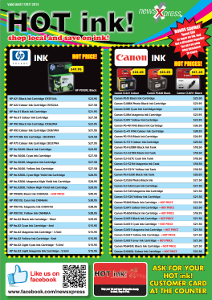 For toner and inkjet cartridge orders please contact us to order by phone or e-mail or visit us to purchase in store. Be sure to ask if you need any help in selecting the right cartridge for your printer. If we do not have your cartridge in stock we will do our best to get it for you.